The Multi-Cal ISE system allows the user to store multiple calibration ranges in the laboratory and then retrieve them for use as needed in the field. The Multi-Cal kit provides from two to four calibration ranges and the LabNavigator monitors up to four ISE's simultaneously. 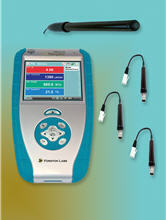 The handheld LabNavigator with Multi-Cal for ISE provide multi-range, immediate, spot-on, field chemical analysis. Multi-Cal kits are available for Nitrate, Ammonium, pH, Calcium, and Chloride with others on request.